Cable & Telecom Keep customers happy by showing up on time, every time. Construction & Heavy Equipment Improve productivity, mitigate equipment and inventory theft, improve workplace safety. 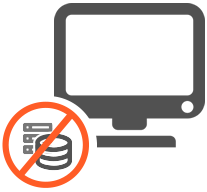 Distribution Improve profitability for dynamic and recurring routes. Food Delivery Faster deliveries with enhanced visibility to customers and stores with less handling. Government & Public Safety Enhances state & federal fleets like lottery, DOT, and more. Medical & Healthcare HIPAA compliant route optimization, route management, and fleet management. Oil, Gas & Mining Comply with regulations, travel only on approved roads (or offroad), sync IoT assets & drones. Security Secure & confidential route optimization and planning for armored vehicles. Services Schedule same-day or recurring service schedule work-orders. Utilities Identify and optimize pole repair and replacement, using recurring and dynamic routing. The Definitive Guide to Route Optimization How to Structure Your Team of Drivers How Small and Medium-Sized Businesses Benefit From Optimized Routes Asking the Right Questions – How to Evaluate A Route Optimization Platform Route Planning Tips and Tricks Optimize Field Sales Strategies that Attract More Buyers Plan Smarter, Deliver Faster, Add a Human Touch to Route Planning How Successful Companies Fuel Growth With A Route Optimization Platform 5 Ways Your Delivery Team Will Make 2017 A Success Grow! Grow! Grow! Don’t Let the Wrong Route Optimization Platform Stunt Your Growth Personalizing Your Delivery Stops for New Accounts The 3 Essential Components of an Route Optimization Solution Configuring Territory Planning Insights for Your Sales Team 7 Steps to Creating a High-Impact Dispatch Process Easily Switch Over to Route4Me from Other Route Planning Platforms How Route4Me Automatically Processes WooCommerce Orders How Sales Managers can Improve Revenues with Route4Me How the Best Dispatchers Use GPS Tracking Data Turning Customer Trust into Profit Deciding if it’s Worth to Expand to a New Customer Expand into New Markets with Confidence Planning Driver Operations 6 Months Ahead of Time Planning Routes for 5000 Addresses How to Manage Multiple Subcontractors Without Sacrificing Quality I Have 5 Drivers and They All Cover Their Assigned Areas How to Increase Profits Without Hiring More Drivers I Need to Add New Customers to My Operations Effectively Why Are My Competitors Always Beating Me? My drivers are having issues with gridlocked areas I can’t expand because of the additional costs I’m growing too quickly & can’t handle running the show How to 2x Your Business Valuation Before You Sell It What Are My Drivers Really Doing? Type, copy-and-paste, or upload your customer list. Then, pick the number of drivers and hit optimize. That's it! Within about 10 seconds you will have an optimized route for yourself - or for every driver on your team. Routes are optimized just as quickly when doing large fleet route optimizations. You Want to Keep Doing it the "Old Fashioned Way"
Optimizing routes using Google Maps, Microsoft MapPoint, paper maps, or simply guessing is a huge financial risk to you. Your routes are planned in seconds for all your drivers. During the 7 Day Free Trial you will see by how much you can instantly increase your profits by reducing miles, fuel, and possibly drivers. We're the only route planning company confident enough to offer a Free Trial and 100 percent refund of every penny you paid during the trial period. And, if you paid more than $6,000.00 on fuel last year, we guarantee that our software will be worth at least $3,000.00 to you - and it only costs as low as $249/month. That's a 300% return on investment, guaranteed. And even if we're only half right, you'll still pocket over $1,500.00 and spend less than 10 minutes per day planning routes. During the 7 Day Free Trial you will see how much money you are wasting, so that you can instantly increase your profits by reducing miles, fuel, and possibly drivers. Do you think FedEx or UPS could service millions of customers each year if they were still using pen and paper, a whiteboard, or Google Maps? 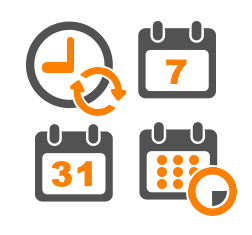 Visiting more customers with Route4Me is easy if you want to save time on planning routes. On average, Route4Me users reduce their daily route planning chore to less than 10 minutes per day, but drivers may experience a staggering 35% reduction in drive time. The time and money savings are even bigger for fleets looking for a fleet routing software solution. Route4Me optimizes your route when traveling to multiple destinations [...] Route4Me claims that routes are usually 25-35% shorter after being optimized. 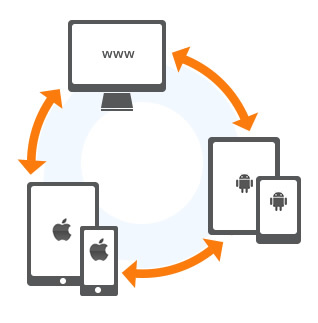 Route4Me was the first dynamic routing company to release mobile apps on the iPhone, iPad, and Android simultaneously. And because we started working on dynamic routing before anyone else, we have the world's fastest and most used dynamic route optimization software. Forget about multi-week training sessions or lengthy and tricky user manuals! Our website and easy-to-use mobile apps, in the Google and Apple store, are designed to be intuitive and user-friendly. 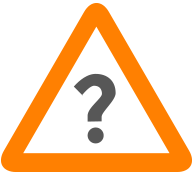 Should you need help, you can visit our Knowledge Base, or access our support team by e-mail, live-chat, or the phone with business account types. When Ms. Schuttig, Marketing Director of Signature Home Buyers, a local investment company that buys, sells and renovates properties in the upstate New York area, expanded the coverage to 2-3 new persons posting 80 - 100 signs every weekend over a 40 mile radius, she used a map to train them. "I had to hand-hold them the entire time", she said, "and, if they were not familiar with the area, they zig-zagged all over the place." Over 5,000 businesses reported specific increases in their incomes last year as a result of our service. Many reported time savings on planning routes of about 20 hours per week, and drivers experienced a reduction in drive time. 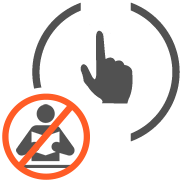 Once it's been repeated for hundreds of millions of stops, it's no accident - it's a proven system that you can use, too. Our vehicle route planning software works for all business types. "Just put in the addresses, and let it work its magic." Weekly pool cleanings, schedule sales visits, or delivery routes that change daily are no longer a problem. Because no matter how often your business requires you to visit customers, our service routing software lets you plan routes that fit any schedule, shape, or size. And it's not just limited to dynamic delivery route planning or service route planning, but you can use it for sales route planning. The app could be particularly helpful for Small business owners who regularly make multiple deliveries in a single trip. Why keep throwing money at obsolete software from the legacy software companies (you know who they are!) when you can spend as little as $249/month for a Team plan with no software to install or upgrade? Forget about compatibility issues or mandatory yearly updates. Route4Me works on the iPhone, iPad, Android, Google Chrome, Internet Explorer, Firefox, and Safari. 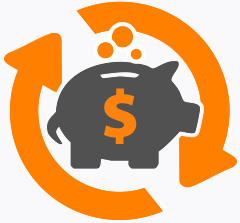 Software updates happen many times per day at no additional cost to you. Amber Saujon, Marketing Operations Manager for American Newspaper Solutions, Wichita, Kansas: "A client thought they had 100% saturation, but I knew they didn't. I brought up the app, to show the area to my client, which proved my point." Client relations, immediately optimized routes, visual confirmation of new routes, and no printing or paper wasted—all make this Market Operations Manager happy with Route4Me. Our service is designed to reduce the amount of time it takes you to plan routes. In addition to servicing more customers with our service routing software, you and/or your drivers will also save gas, time driving, and decrease your environmental footprint. And, since Route4Me costs less per driver, as you add more team-members, fleet route planning savings really add up. Every route is up to 35% shorter on average. That's over $1,000.00 in savings if you spend more than $3,000 a year on gas. Stay in control by letting you track the location of all your drivers. Efficiency starts with saving your own time, but extends to saving the time of your drivers and customers. Want to impress your investors, partners, or boss?  Then boost your customer count - the one true marker of business growth and success. As you add more customers, the time and cost complexity of servicing all of them goes up exponentially. 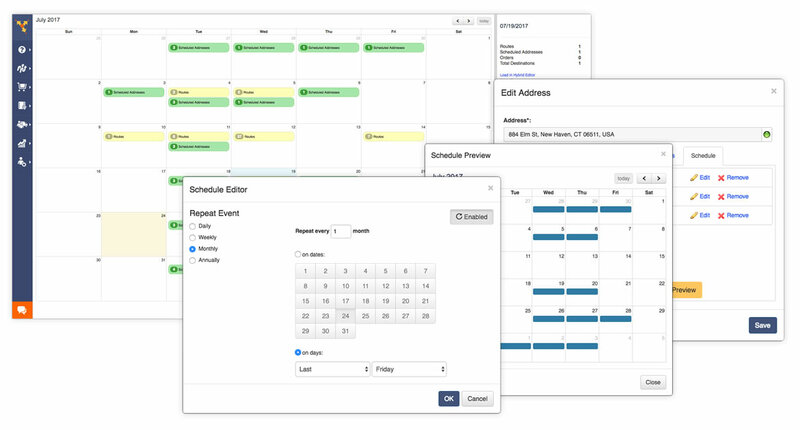 Planning employee schedules, routes, and tracking field personnel are the biggest hurdles to growth for any field-service, field-sales, or delivery business. Route4Me's service routing software will help you exceed all of your business needs by improving customer satisfaction, lowering your operational costs, and by reducing the time it takes to plan routes to less than 10 minutes per day. Just type, copy-and-paste, or upload your list of customers or addresses that you need to visit. Hit plan route, see the optimized route on your computer, get it on your mobile device right away, and travel it. Upload large files having hundreds or thousands of orders, one or many depots, with support for dozens of regions, hundreds or thousands of drivers. 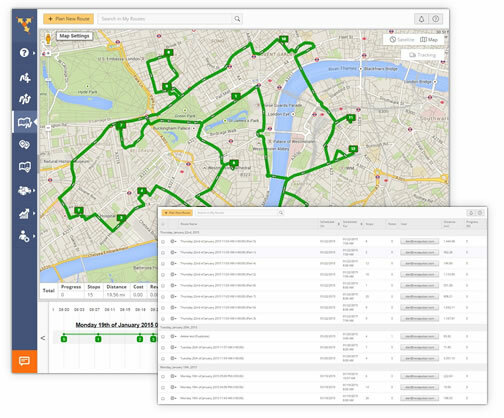 Optimized routes are created and distributed to field personnel, and they can be tracked in real-time. 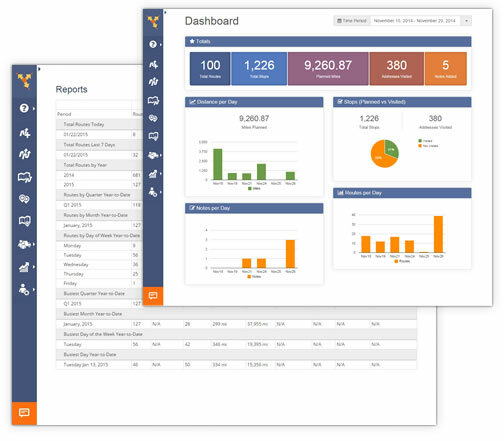 From a single dashboard, you can track the team, move customers from one route to another, monitor your entire fleet, and much more. Our mobile route planning apps feature real-time synchronization of all of your routes and customer addresses, written notes & photos at each stop, sign-on-glass verification, route progress & location tracking, and more. Route4Me is the only route planning software that has native applications built for the iPhone & iPad and the Google Android platform. And, with over 1,750,000 downloads and tens of billions of miles planned since 2009, you can rest assured that our Mobile Apps been continuously tested and improved over the years. The Route4Me app offers turn-by-turn directions and works automatically with Google Maps, Waze, and over 500 telematics vendors. Our fleet route planning software has mapping data for every country in the world, so when you start planning optimized routes for your business, it will work in your country. 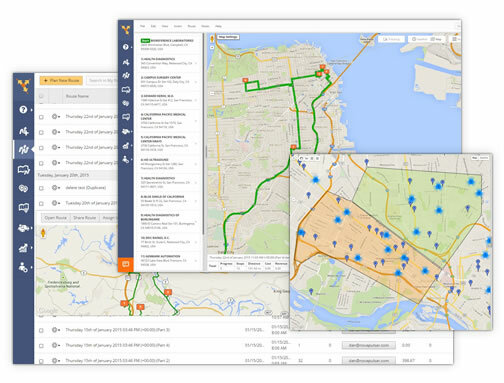 Map, search, and categorize your customers & prospects using Route4Me. If you're a new business, you can enter customer information every time you close a new account. And, if you're already established - you can upload thousands of customers at one time. As business continues to grow, you can setup sales and delivery territories. 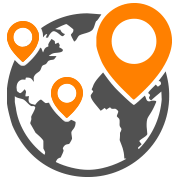 Once addresses are loaded, just select the ones you want to visit, or easily plan a new route by drawing a region around customers that need to be visited. You can even specify the exact time at which a customer should be visited. If you have multiple routes and drivers, Route4Me provides an overview of your entire operation. Re-assign drivers and vehicles, move an address from one route to another, and track route progress in real-time. In addition to our fleet routing optimization capabilities, your Route4Me account is connected to our Mobile Apps, so that drivers and customers immediately get notified of changes you make, and you see every address, order, note, picture, video, and modification they make inside your account. You'll see your business in a clearer way because we'll show you detailed mileages, route manifests, and fuel cost dollars saved. In addition to detailed driving costs, each address on a route can capture extended information such as revenue, cost, and service-time. You don't need to be good with math or fancy accounting software. 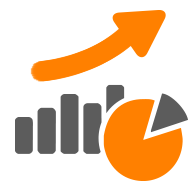 Everything related to your operation is automatically calculated and can be used to make common business decisions. In a few clicks you can see really helpful info about a specific route, driver, or region. Route4Me is the only route optimization software on the planet which has iPhone, iPad, and Android applications which permit you to attach notes and media to any stop on your route. 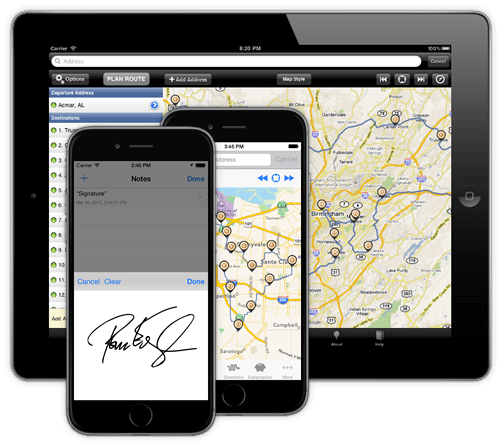 You and your drivers, users, customers, or employees can mark each location as visited, departed, have sign-on-glass eSignatures, and you can see all notes, media, and track all progress from everyone in your company instantly within your Route4Me account. Arrival and departure times in the route manifest update as soon as a check-in or check-out happens.